I’m new to Macs and can’t seem to copy videos taken on my iPhone over to iMovie. The Mac seems to want to open iPhoto and sees the videos as a picture. Is there anything I’m missing? Shoot a movie with your iPhone or 4G iPod touch and then attach the device to your Mac via the sync cable. By default, iPhoto and iTunes open. Check iPhoto’s Library pane and you’ll see your iPhone listed as a camera. Again, by default, its contents will appear in iPhoto’s main window. Movies you’ve captured with your iPhone will appear with a small camcorder icon in their bottom left corner. Select those movies and click the Import Selected button and the movies will be imported to your iPhoto library. When you launch iMovie it will likely ask if you’d like to update thumbnails for videos in your iPhoto library. Let it do that by clicking the Now button. 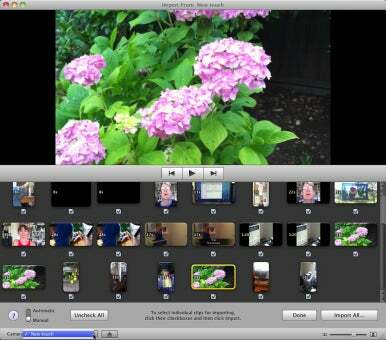 When iMovie’s done you should see the clips you’ve recently imported into iPhoto. This describes how it was done prior to iLife ’11. If you have the latest version of iMovie you have a more direct route. iPhoto will still launch and you can still import your iPhone and 4G iPod touch movies into it, but you can also import movies directly into iMovie ’11. Launch iMovie ’11, attach your iPhone or 4G iPod touch to your Mac, and click the Camcorder icon that appears just above the Event Library. In a short while iMovie will recognize the iPhone or iPod touch and produce an Import From window that includes all the videos on the attached device. At this point, import the clips just as you would from any compatible camera or camcorder. Select the clips you want and click the Import Selected or Import All button. In the sheet that subsequently appears, choose the event you want to place the clips in (or create a new event). If you like, enable the After Import Analyze For option and choose Stabilization and People, Stabilization, or People from the pop-up menu. Click Import to begin importing the clips.